This is the reality part, and frankly, I just felt the first post was big enough and didn’t lend itself to becoming even longer, to include all the flip side of the new Vista wow. I am not sure if they changed their ways since Win 95, but it seems to me that Vista still has a lot of optimizations to go. The code still seems bloated and even seem to have racing conditions at times. Of course, some of it could be remnants and problems due to super-embedded DRM that Microsoft put in there. Speaking of DRM, I think this one is a Grand mistake, especially if, as some reports say, it has such profound impact on system performance and Operating System Resource requirements. It feels like Microsoft is forgetting that it’s ultimate customer is Me and You and Not Hollywood! They will look especially dumb if Hollywood realizes, just like Music labels starting to realize, that DRM only limits their sales! Legitimate users who are willing to pay for media, end up avoiding and rethinking that due to all the compatibility and functionality problems it causes. Also, some of the bugs blamed on Vista are not Vista troubles at all, and would occur just the same on Windows XP, check out this investigative example. To summarize, Windows Vista definitely has it’s share of bugs still. Consider that so many Kernel and other components were redesigned, I think this should be expected. The biggest emphasis in Vista remains on security, and I really praise Microsoft’s focus on the very hard task of protecting the users from themselves. Visual Effects and Search of everything functionality is very handy, but of course comes at a price. So, as I said earlier, upgrading is not a good idea. 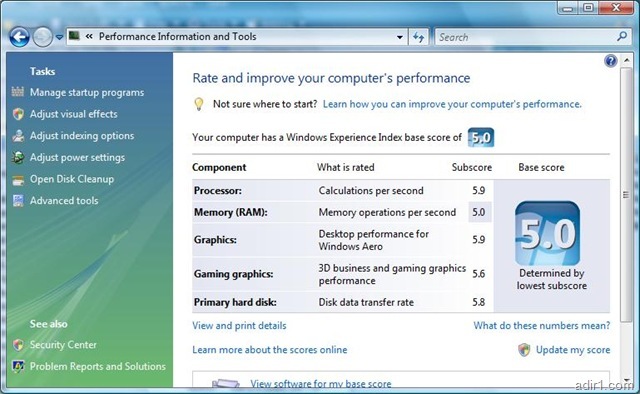 But, if buying new powerful PCs of today, with 2 or more cores, opt for Vista to get the most of your new hardware. Hopefully, this is the last time I will post on Vista, until something else major develops. Pingback: adir1 » Blog Archive » Windows Vista - I found the WOW! You forgot to provide a link to explanation of DRM.